Edmond Tan, one of the Co-Founder at Juggar reached out to us when Juggar did a soft launch a few weeks ago. After a few emails to and fro, I thought that this was pretty interesting and agreed to write an article on it. 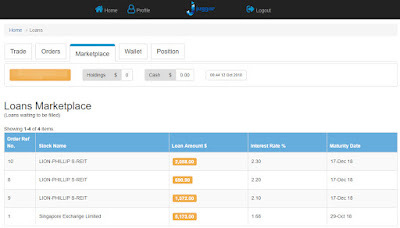 Juggar is a P2P lending platform for share financing platform. 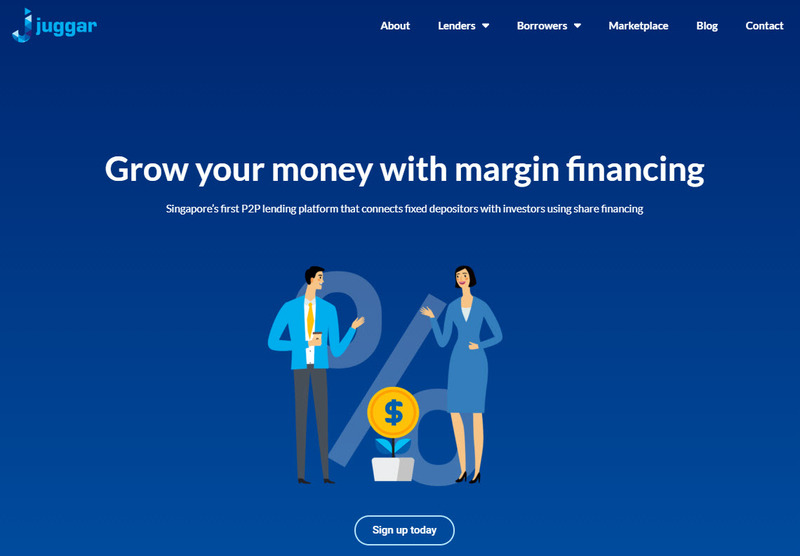 If you are familiar with the other P2P lending platforms available in Singapore, names such as MoolahSense and Funding Societies would come to mind where you will be the "debtor", lending your money to various companies. 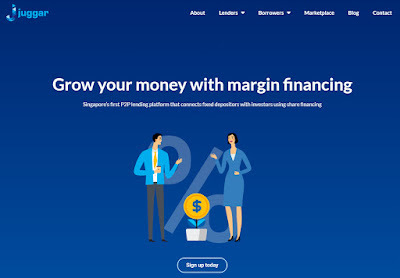 However, with Juggar, you can actually become the "borrower" and use the money to invest in SGX shares using margin/leverage. 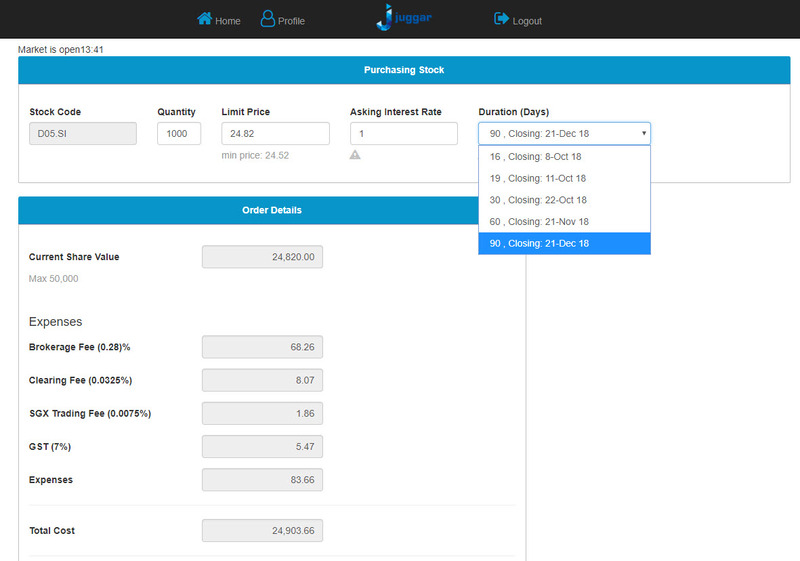 In another word, Juggar is a combination of P2P lending + CFD trading. As a borrower, there is the possibility of paying interest as low as 2% with 30% collateral. 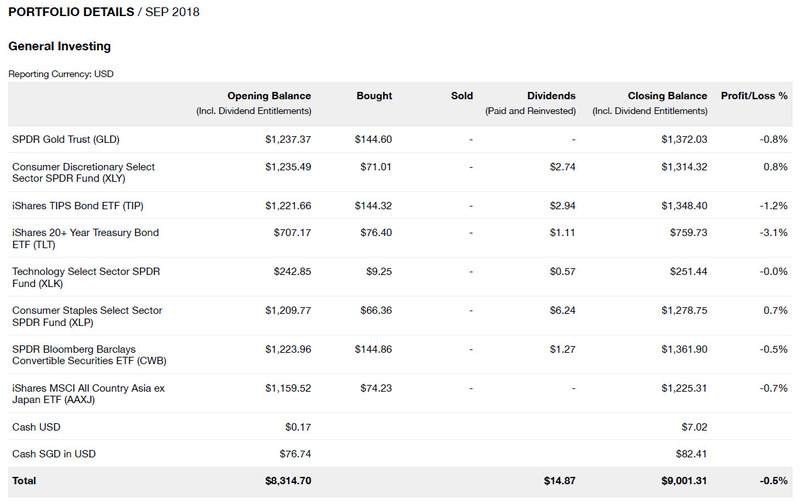 I thought this is pretty attractive because as a SCB Priority customer, we were given a fixed rate of 1.6% + 1-month SIBOR (in total, the interest rate we got would be ~3.1%) after pledging 70% collaterals - Leverage - A Double-Edged Sword. 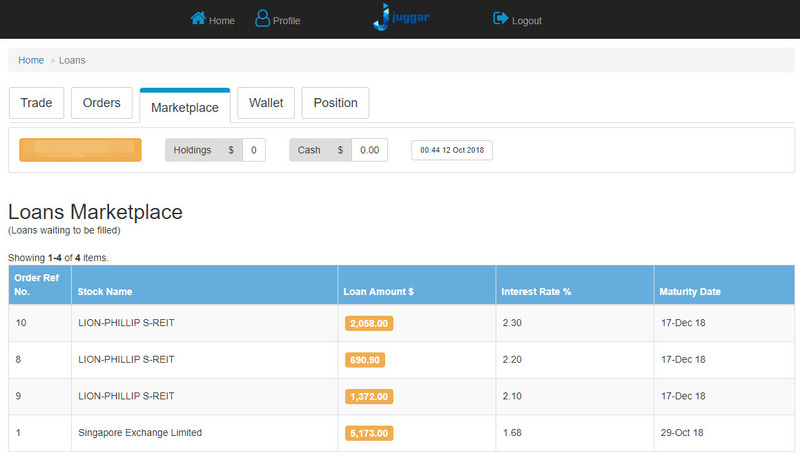 In addition, Juggar will provide the loan at a rate of 2.5% (claimed to be the lowest in the market by Juggar) while waiting for the loan to be funded by a lender. Being a lender is pretty straightforward, you go to the "Marketplace" and select a loan which you will like to lend to based on the various information such as loan amount, interest rate and maturity date. Do take note that the interest rate stated is on an annual basis and not on the loan tenure. 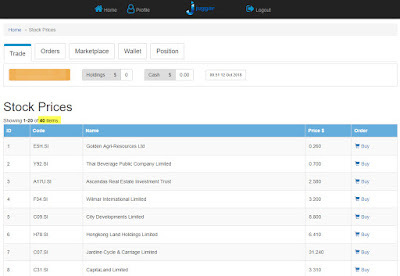 There are currently 40 stocks available for the borrower to buy. As an example, if I would like to buy 1,000 units of DBS at $24.82. Under normal circumstances, I would need ~$25k cash to do that. However, with Juggar, I would only need ~$7.5k including the trading commission. 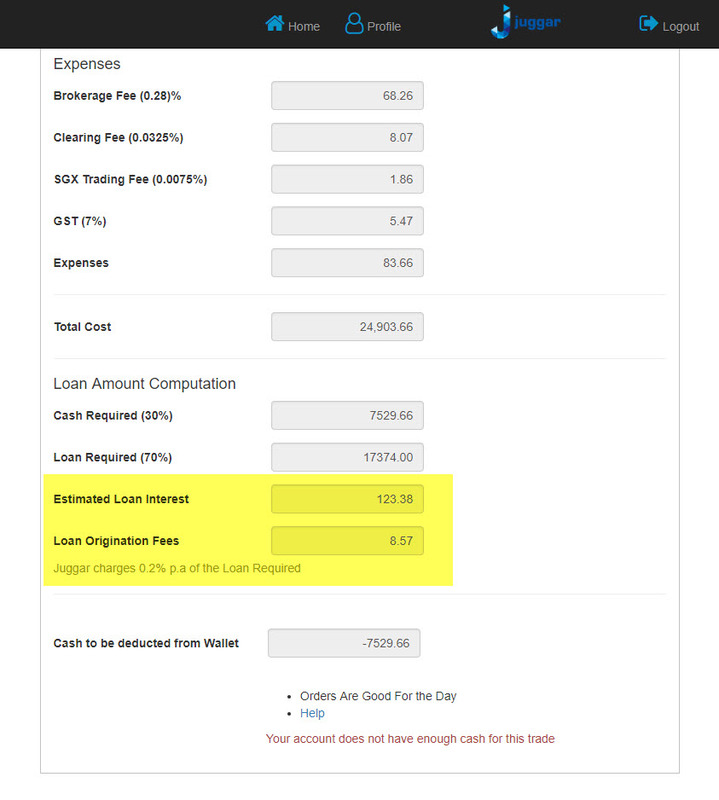 Do take note that the loan and fees are only paid at the end when the position is closed. 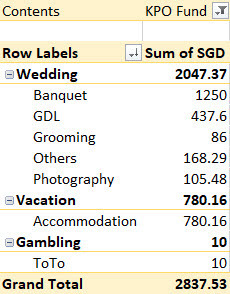 Assuming if the price of DBS increase to $26.00 within the trade tenure, my profit would have been 13.33% [(26 - 24.82) * 1000 - 83.66 * 2] / (7529.66 + 123.38 + 8.57) as compared to 4.07% [(26 - 24.82) * 1000 - 83.66 * 2] / (24,903.66) without using any margin. The losses would also be magnified accordingly. That is why it is a double-edged sword. If you are not familiar with margin trading, I suggest that you read up more first. KPO: When would you be expecting the MAS license to be granted? Technically, Juggar can't go live without one right? Edmond: Our legal structure do not require us to apply for the MAS CMS license although we have to work with some limitations with our current legal structure. This structure is created in conjunction with our legal consultants and have been acknowledge by NUS Enterprise, SMU IIE and Spring Singapore. KPO: Let's say if Juggar goes bankrupt/face liquidation, how would it work for both the lenders and borrowers? Edmond: We maintain a separate account for cash and shares that is not commingled with Juggar's operations. Under the legal documents, it is also stated that we have to maintain a record for each lender and borrowers and their funds/shares is not an asset of Juggar and cannot be pledged for any other purposes. KPO: At the start, I was told to select to be a borrower or lender. 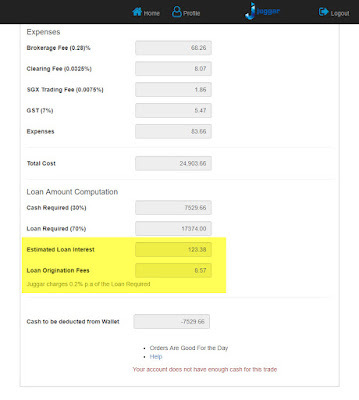 Does this mean after I selected the borrower, I will not be able to lend? In addition, I cannot find the option to change it. Edmond: Yes, as part of our legal structure, user can only be either a borrower or lender. The change of role form a borrower to lender has to be done by us manually as we need to ensure there is no open positions. KPO: Let's say if a borrower is unable to top up the difference and you guys had to force sell the shares before the loan period ends. Would the lender still be getting back the full amount? Will it be returned after the position is closed/force sell or would it be reloan to other borrowers until the initial loan period ends? Edmond: If we force sell the shares, the principal, interest and early prepayment interest will be paid back to the lender. We trigger the force sell at 130% margin ratio (Market value of the shares is 30% more than the Principal of the loan). we do not lend the money out again to other borrowers.KPO: If that is the case, it seems to be pretty safe for a lender to lend out their money. Under what scenario (if any) would a lender lose his capital? Edmond: Lender will start losing their capital if in a very short time span (1 day) the share price drop by more than 30% and we did not have enough time to sell off the shares. 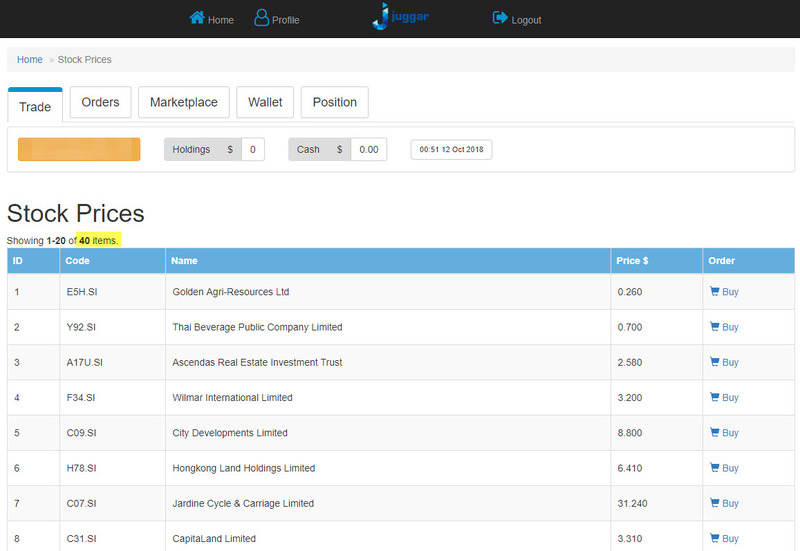 1 instance will be that something happen to the company after market close and the next day the market open,the price is down by more than 30%. We ran numbers on STI component stocks, this hadn't happen in the last 20 years. 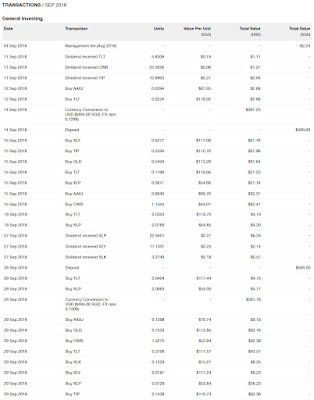 KPO: What happens if I selected a 90 day period and decided to sell it on the 70th day? 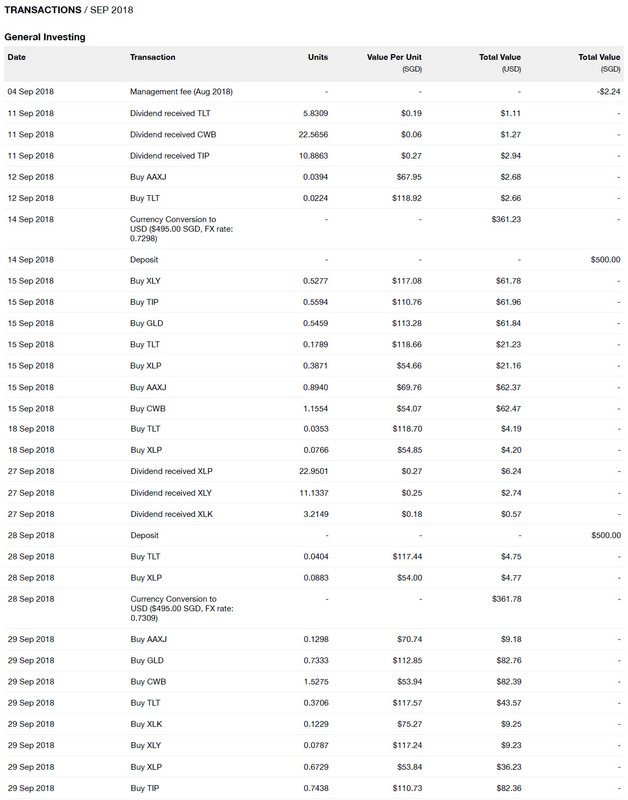 Do I pay interest for the 90 days or it will be automatically computed accordingly? Edmond: You will pay 10% of the interest for the unused period. So for instance the interest for the remaining 20 days is $100, you will pay the lender a penalty of $10 that’s all. KPO: For a borrower, once the loan tenure ends, I supposed the position will be auto-closed? How would the price be determined then? Or is there a way to extend the loan? Edmond: Juggar will at its discretion sell the shares at the market price between 4.30pm - 5pm at the day the loan matures. If you were to use our referral, you will be given a credit of $100 which will only be credited into the account after your first trade. To do that, simply email charlotte@juggar.co with the referral code "KPOCZM" and do keep us (kpooooooooooo@gmail.com) in the cc as well :) For every successful signup and upon your first trade, we will be paid $50. 2. 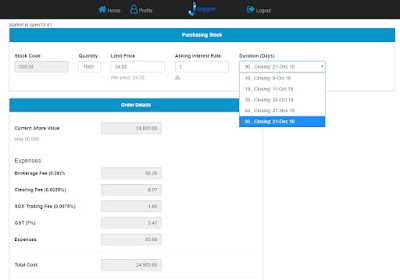 The user has to have a total holding period of 21 business days across 1 or more trades. The holding period for different trades with a trade size of at least $1,000 can be added together to make up the 21 business days. 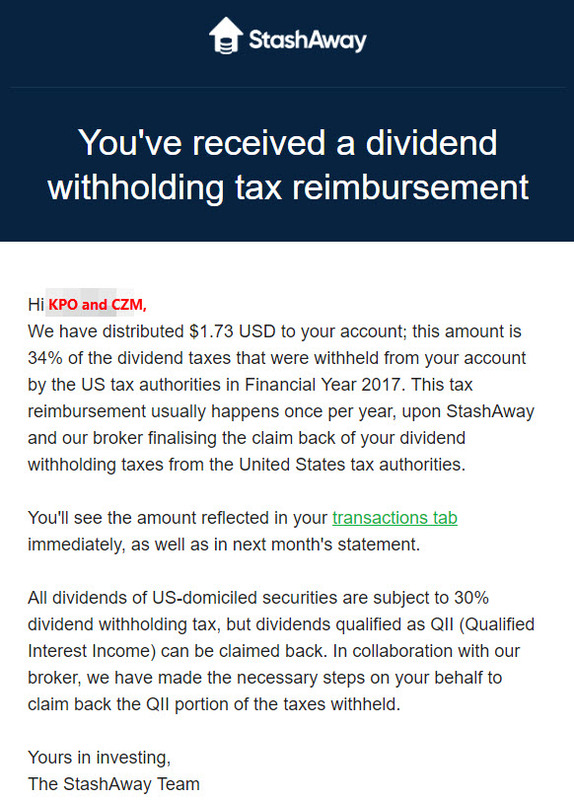 2 weeks back, I received an email from StashAway titled "You've received a dividend withholding tax reimbursement" but have yet to look into it until a few days ago. Chances are you (StashAway users) would have received it as well. This was a pleasant surprise because we had long accepted it as one of the cost to invest in the US and were not expecting to get the withholding tax back. 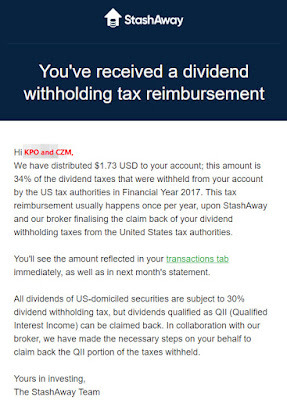 For the withholding tax (WHT) reimbursement, we do not receive dividend reimbursement for all ETFs but only those that qualify under the QII (Qualified Interest Income) rule. 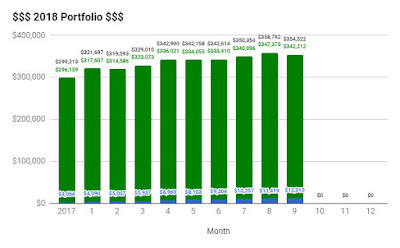 Only some of the dividend WHT from US domiciled funds (e.g. US government bonds) can be claimed back. As such, we did not receive any dividend reimbursement for XLK and XLY. 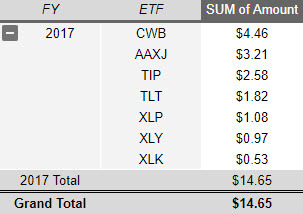 For further illustration, you may like to view the Dec 2017 iShares report on QII ETFs. Some examples of QII ETFs that StashAway invests in are 20+ Year Treasury Bond (TLT) and 10-20 Year Treasury Bond (TLH). I also took this chance to compile the total dividends we received for the financial year 2017 including the withholding tax reimbursement which comes up to USD $14.64. 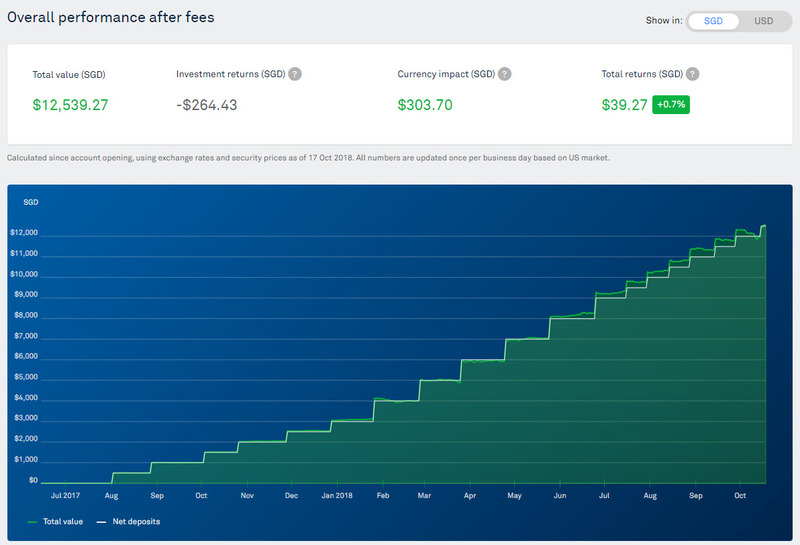 On the other hand, the total fees charged by StashAway adds up to SGD $7.49 which seems pretty sustainable (dividends > fees). Ideally, the portfolio should grow in the future even without the injection of fresh funds and if the fees > dividends, that would mean that the fees would eventually eat into the capital. 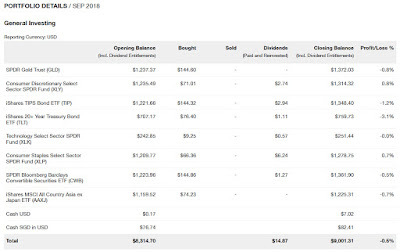 A "Dividends" tab has been added to the spreadsheet - KPO & CZM StashAway Portfolio VS STI ETF but I have yet to update the numbers using the latest statement. Shall get it done over the weekend! Hello everyone! It has been a while and our wedding is finally over! Both of us have been upgraded from S to M (not Small to Medium but Single to Married) <-- that's what our JP (Justice of the Peace/solemnizer), Mr. Mike Tam Chee Wah said. The ceremony was entertaining and he was able to alternate between both languages (English and Mandarin) comfortably. We certainly made the right decision to engage him as our JP. One of my brothers was so impressed with him and tried to book him for next year but he was already booked. Do try to book/reserve him in advance! Our wedding was exceptionally smooth thanks to all our brothers and sisters! CZM was also kind enough to spare me from those torturing gatecrash games and I only had to give a red packet + signed my life/money away to CZM (those contract where my money is hers while her money is still hers, do household chores, etc.). Unfortunately, everything happened so quickly on that day that we barely had time to interact/catch up much with our guests and both of us were feeling slightly unwell (headache, flu and no appetite). However, when it was time to count the ang bao (red packet) money, both of us miraculously "recovered". lol. I might have blogged about this previously that we did not want to hold a wedding banquet initially but after sounding our parents out, we decided to go ahead with it. After all, we believe that a relationship is not just about us but our family too. Our plan was to keep everything small and simple so we had an initial budget of about $10,000 to $20,000 and I am proud to say we were lucky enough to keep it way below our budget! This is a breakdown of the top 10 expenses which accounts for 95.94% of the total expenses. If you think that we spent too much on a specific category/shop and should/could be cut for yours, look no further. Having said that, the full breakdown can be seen at the end of the article. We definitely took a lot more Grab/Comfort than usual because we were rushing/got tired from the preparation. For those that prefer to look at pie chart instead of numbers. 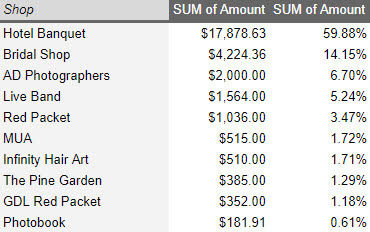 If we look at the cost of the banquet ($17,878.63) vs the ang bao we received ($23,406.00), we actually made a profit of $5,527.37. I guess this is what people meant when they say they managed to "cover back"? Realistically speaking, I think there is only an extremely slim chance of making a profit from the wedding after including all the relevant expenses and one really should not have such an expectation. From the above breakdown, it is obvious that most of the money came from my relatives. How it works for us is when CZM's parents requested for X number of tables for their relatives, all those ang baos will go directly to them and it is theirs to keep. My parents gave us $2,000 for Jin Cha (tea ceremony) and my 3 grandmothers gave us $1,700 in total for the banquet ang bao. These are outliers that really helped a lot. On average, our friends and colleagues gave more than enough for us to cover the cost of the banquet (~$102 per pax) too. The one takeaway is even if you are not planning to hold a wedding banquet, the tea ceremony is a must! Hahahaha. The tea ceremony would cost you almost nothing (except for the tea set, tea + your mouth/voice) and you get lots of ang baos + some gold. We were trying to value/include those gold into our income but most of the gold (5/8) that we received did not have any receipt with them. The overall damage would have went down further if we were to add the value of those gold in. 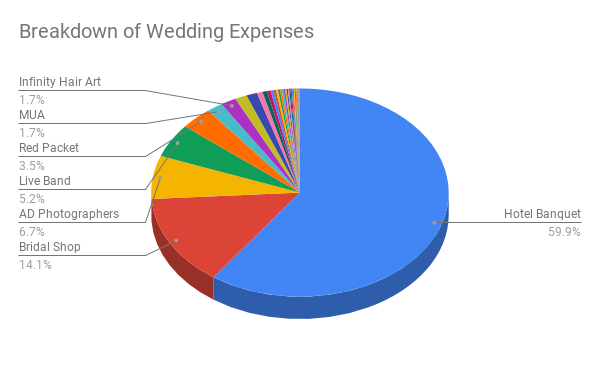 Hope you enjoy our wedding expenses and income breakdown!